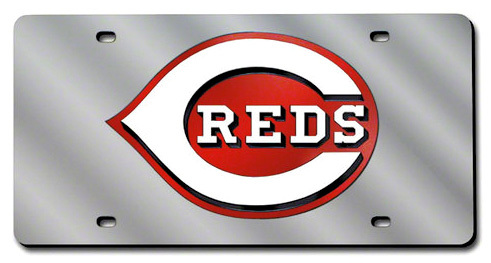 Cincinnati Reds - MLB Laser Tag / Mirror License Plate. Officially licensed MLB Baseball 6" x 12" acrylic mirror license plate with Cincinnati Reds team logo laser engraved in the center. Cincinnati Reds / Great American Ball Park Framed and Matted Panoramic Photograph. This officially licensed MLB panorama photo is of the Cincinnati Reds at the Great American Ball Park in Cincinnati, Ohio. The Cincinnati Reds played the Pittsburgh Pirates in a game during the 2013 season. The deluxe panorama features black or blue double matting and your choice of black or cherry frame, with a 1" x 4" engraved brass nameplate. Actual size is 40" x 14"
Cincinnati Reds / Great American Ball Park Framed Panoramic Photograph. This officially licensed MLB panorama photo is of the Cincinnati Reds at the Great American Ball Park in Cincinnati, Ohio. The Cincinnati Reds played the Pittsburgh Pirates in a game during the 2013 season. The standard panorama features your choice of black or cherry wood frame. Actual size is 40" x 14"
Cincinnati Reds / First Pitch Great American Ball Park Framed and Matted Panoramic Photograph. This officially licensed MLB panorama photo is of the Cincinnati Reds (First Pitch) at the Great American Ball Park in Cincinnati, Ohio on March 31, 2003. The Cincinnati Reds played the Pittsburgh Pirates. The deluxe panorama features black or blue double matting and your choice of black or cherry frame, with a 1" x 4" engraved brass nameplate. Actual size is 40" x 14"
Cincinnati Reds / First Pitch Great American Ball Park Framed Panoramic Photograph. This officially licensed MLB panorama photo is of the Cincinnati Reds (First Pitch) at the Great American Ball Park in Cincinnati, Ohio on March 31, 2003. The Cincinnati Reds played the Pittsburgh Pirates. The standard panorama features your choice of black or cherry wood frame. Actual size is 40" x 14"
Cincinnati Reds / Who's at Bat? Cinergy Field Framed and Matted Panoramic Photograph. This officially licensed MLB panorama photo is of Cinergy Field in Cincinnati, Ohio, during a matchup with the St Louis Cardinals. It was late in the 1998 season, the year of The Great Home Run Chase, and (Who's at Bat?) Mark McGwire. The deluxe panorama features black or blue double matting and your choice of black or cherry frame, with a 1" x 4" engraved brass nameplate. Actual size is 40" x 14"
Cincinnati Reds / Who's at Bat? Cinergy Field Framed Panoramic Photograph. This officially licensed MLB panorama photo is of Cinergy Field in Cincinnati, Ohio, during a matchup with the St Louis Cardinals. It was late in the 1998 season, the year of The Great Home Run Chase, and (Who's at Bat?) Mark McGwire. The standard panorama features your choice of black or cherry wood frame. Actual size is 40" x 14"